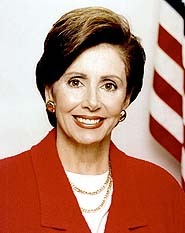 Nancy Pelosi is a Democratic Congresswoman from California, and during the 110th and 111th Congress she was the first woman to serve as Speaker of the House. She comes from a family steeped in politics. At age 7, she stood beside her father when he was sworn in as Baltimore's first Italian-American Mayor in 1947. Democratic to the bone, the D'Alesandro family never moved out of the city's working-class Little Italy neighborhood. Pelosi's mother had dropped out of law school to marry, but she became a leader at the local Democratic Women's Club. Pelosi's brother, Tommy D'Alesandro III, followed in their father's footsteps and was Mayor of Baltimore from 1967-71. Pelosi says that she once dreamed of becoming a priest -- never a nun -- because it was obvious to her the priests had the power in the church. Her parents sent her to a Catholic, all-girls high school, then to an all-women's college. She married her first serious boyfriend, rising businessman Paul Pelosi, and moved with him to New York, where he became prosperous and she became the mother of five in just six years. In 1969 they moved to San Francisco, where she volunteered for Democratic causes and worked in the campaigns of California Congressman Phillip Burton. By the mid-1970s she was a prominent voice in local politics, and in 1981 she was elected to chair of the state's Democratic Party. Burton died in 1983 and was replaced in Congress by his wife, and when Sala Burton was diagnosed with cancer she asked Pelosi to take her seat. When she died in 1987, Pelosi won a special election, and she has represented San Francisco in Congress ever since. Pelosi is a supporter of equal rights for gays and lesbians and a woman's right to choose (abortion). She has worked to increase funding for AIDS research, education, and environmental protection, and tried to block communist China from receiving "most favored nation" trading status. She favored background checks for people purchasing handguns, and lengthened prison sentences when guns are used to commit crimes. Her largest financial supporters have been the United Auto Workers and the Ernest & Julio Gallo Winery. Pelosi sports some non-liberal views as well. She voted for the PATRIOT Act, for NAFTA and CAFTA, and in favor of the proposed 700-mile wall along the Mexican border. She was briefly skeptical of President George W. Bush's saber-rattling against Iraq, but when the threats came to war in 2003, she voted for a House resolution offering "unequivocal support and appreciation to the president... for his firm leadership and decisive action." As a longtime member of the House Intelligence Committee, she was briefed on Bush's secret warrantless wiretapping of US citizens at least six months before the story broke in the newspapers, and voiced no objections. Like most members of Congress, Pelosi is a multi-millionaire. Mostly on the strength of her husband's portfolio of commercial real estate, the Pelosis' net worth is at least $25M and may be as high at $92M -- financial disclosure forms for federal officials report assets and liabilities in broad ranges, so the figure is difficult to pinpoint. The Pelosis own a small office building in San Francisco and another in the suburbs of Marin County, as well as millions of dollars in stock in Microsoft and AT&T, and a minority interest in Piatti Locali, a small chain of Italian restaurants in California.